Small values of the Prandtl number, Pr << 1, means the thermal diffusivity dominates. Whereas with large values, Pr >> 1, the momentum diffusivity dominates the behavior. For example, the typical value for liquid mercury, which is about 0.025, indicates that the heat conduction is more significant compared to convection, so thermal diffusivity is dominant. When Pr is small, it means that the heat diffuses quickly compared to the velocity. In comparison to Reynolds number, the Prandtl number is not dependent on geometry of an object involved in the problem, but is dependent solely on the fluid and the fluid state. As such, the Prandtl number is often found in property tables alongside other properties such as viscosity and thermal conductivity. Similarly as a velocity boundary layer develops when there is fluid flow over a surface, a thermal boundary layer must develop if the bulk temperature and surface temperature differ. Consider flow over an isothermal flat plate at a constant temperature of Twall. 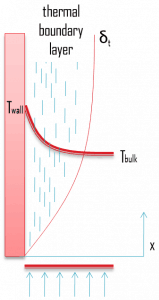 At the leading edge the temperature profile is uniform with Tbulk. Fluid particles that come into contact with the plate achieve thermal equilibrium at the plate’s surface temperature. At this point, energy flow occurs at the surface purely by conduction. These particles exchange energy with those in the adjoining fluid layer (by conduction and diffusion), and temperature gradients develop in the fluid. The region of the fluid in which these temperature gradients exist is the thermal boundary layer. Its thickness, δt, is typically defined as the distance from the body at which the temperature is 99% of the temperature found from an inviscid solution. With increasing distance from the leading edge, the effects of heat transfer penetrate farther into the stream and the thermal boundary layer grows. The ratio of these two thicknesses (velocity and thermal boundary layers) is governed by the Prandtl number, which is defined as the ratio of momentum diffusivity to thermal diffusivity. A Prandtl number of unity indicates that momentum and thermal diffusivity are comparable, and velocity and thermal boundary layers almost coincide with each other. If the Prandtl number is less than 1, which is the case for air at standard conditions, the thermal boundary layer is thicker than the velocity boundary layer. If the Prandtl number is greater than 1, the thermal boundary layer is thinner than the velocity boundary layer. Air at room temperature has a Prandtl number of 0.71 and for water at 18°C it is around 7.56, which means that the thermal diffusivity is more dominant for air than for water. 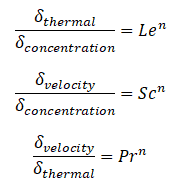 Similarly as for Prandtl Number, the Lewis number physically relates the relative thickness of the thermal layer and mass-transfer (concentration) boundary layer. The Schmidt number physically relates the relative thickness of the velocity boundary layer and mass-transfer (concentration) boundary layer. where n = 1/3 for most applications in all three relations. These relations, in general, are applicable only for laminar flow and are not applicable to turbulent boundary layers since turbulent mixing in this case may dominate the diffusion processes. Air at room temperature has a Prandtl number of 0.71 and for water at 18°C it is around 7.56, which means that the thermal diffusivity is more dominant for air than for water. For a Prandtl number of unity, the momentum diffusivity equals the thermal diffusivity and the mechanism and rate of heat transfer are similar to those for momentum transfer. For many fluids, Pr lies in the range from 1 to 10. For gases, Pr is generally about 0.7. For liquid metals the Prandtl number is very small, generally in the range from 0.01 to 0.001. 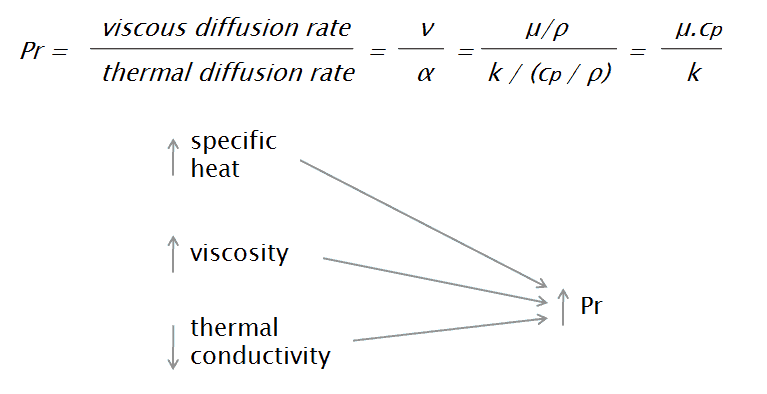 This means that the thermal diffusivity, which is related to the rate of heat transfer by conduction, unambiguously dominates. This very high thermal diffusivity results from very high thermal conductivity of metals, which is about 100 times higher than that of water. The Prandtl number for sodium at a typical operating temperature in the Sodium-cooled fast reactors is about 0.004. The Prandtl number enters many calculations of heat transfer in liquid metal reactors. Two of promising designs of Generation IV reactors use a liquid metal as the reactor coolant. The development of Generation IV reactors represents a challenge from an engineering point of view. One of the main challenges in numerical simulation is the reliable modeling of heat transfer in liquid-metal cooled reactors by Computational Fluid Dynamics (CFD). Heat transfer applications with low-Prandtl number fluids are often in the transition range between conduction and convection dominated regimes. where νt is kinematic turbulent viscosity and αt is turbulent thermal diffusivity. The turbulent Prandtl number (Prt = νt/αt) is a non-dimensional term defined as the ratio between the momentum eddy diffusivity and the heat transfer eddy diffusivity. It simply describes mixing because of swirling/rotation of fluids. The simplest model for Prt is the Reynolds analogy, which yields a turbulent Prandtl number of 1. In the special case where the Prandtl number and turbulent Prandtl number both equal unity (as in the Reynolds analogy), the velocity profile and temperature profiles are identical. This greatly simplifies the solution of the heat transfer problem. 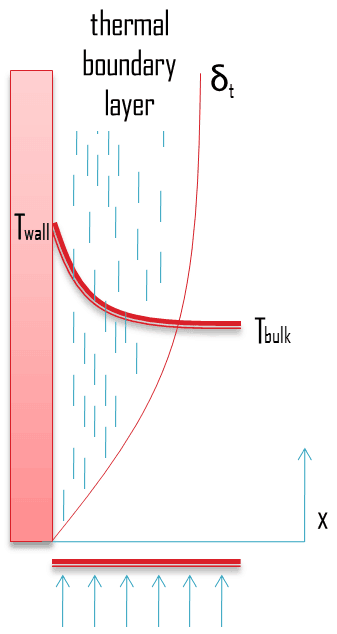 From experimental data, the turbulent Prandtl number is around 0.7 for different free shear layers, and for near-wall flows it is larger (Prt = 0.9) and occasionally beyond 1 since it has a tendency to grow larger when nearing the walls. Fundamentals of Heat and Mass Transfer, 7th Edition. Theodore L. Bergman, Adrienne S. Lavine, Frank P. Incropera. John Wiley & Sons, Incorporated, 2011. ISBN: 9781118137253. Heat and Mass Transfer. Yunus A. Cengel. McGraw-Hill Education, 2011. ISBN: 9780071077866. Fundamentals of Heat and Mass Transfer. C. P. Kothandaraman. New Age International, 2006, ISBN: 9788122417722. U.S. Department of Energy, Thermodynamics, Heat Transfer and Fluid Flow. DOE Fundamentals Handbook, Volume 2 of 3. May 2016.